I hope your Sunday is going well. I'm taking a break between gardening and dinner prep to share this card I made inspired by several challenges. I first embossed some flowers from Verve Poppy Birthday with clear embossing powder and used my new Akashiya watercolor pens to color them in. I really loved how they turned out and it's hard to see under the vellum but the blending was the easiest way I've done coloring. I die-cut a vellum tab out using MFT Blueprints 13 and embossed in purple a sentiment from Quietfire's Happy Family Day with Calligraphic Frame. 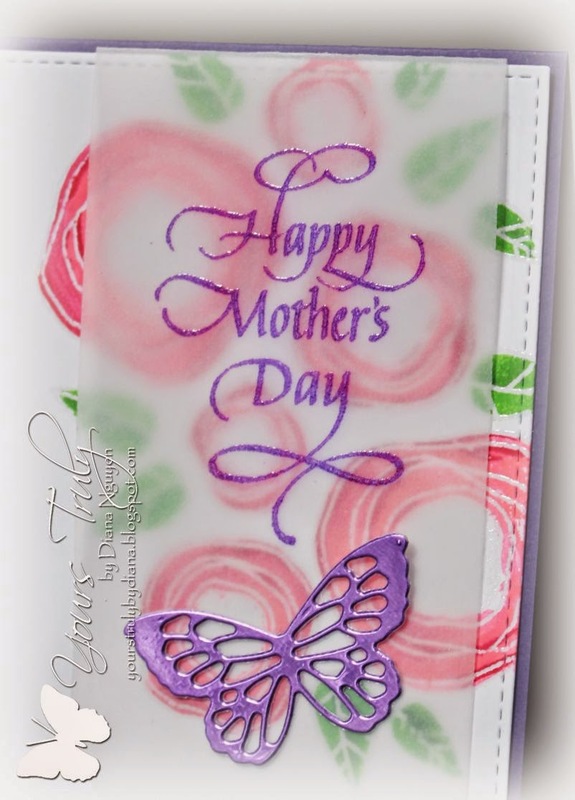 My final touch was adding a Poppystamps Elsa butterfly in Lovely Lavender metal craft sheet. So subtle and pretty.. and I just love the butterfly! It brings everything together!! Nice job and thank you so much for sharing..
Beautiful, Diana! Love those vibrant colors! Thanks for joining us at CASology! So pretty! I love the use of the vellum to soften the images! So glad you joined us at CASology this week! Oh, boy! I really love this! I'm really loving the scripty stamps you're using of late. I do like how you used the vellum. Very good idea. And your butterfly is oh so sweet. Thank you for joining the Poppystamps challenge. Again, very nice joy! Love how the vellum softens the flowers! Thanks for playing along with us at Poppystamps! 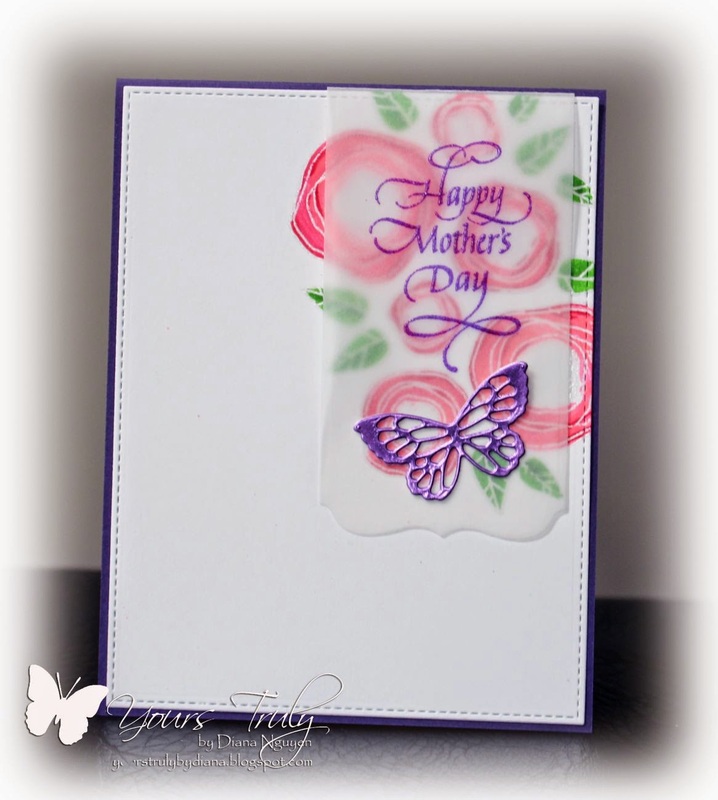 Such a beautiful card Diana, love the soft colour tones with the added velum and your sentiment with butterfly to finish. Thank you for joining us at Poppystamps challenge Blog.. Outstanding CAS design and so full of beauty and tenderness! A perfect card for Mother's day! So pretty! I love the metallic shine and the clean design!